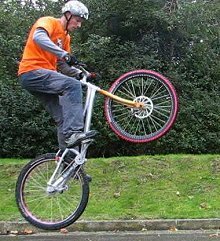 Maybe one of the most useful and primary skills to get in biketrials, is to be able hop on the rear wheel. 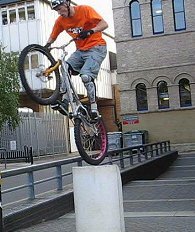 Precision and correction hops are much needed if you want to place your rear tyre on the best grippy bit of rock or wall before you move-on with a pedal kick or any other transition. 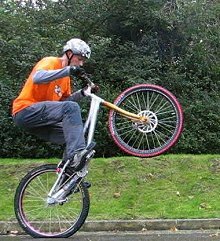 First, you should try to get a feel for the bike on the rear wheel, by rocking your bike back and forth with more and more amplitude, with both brakes locked. Do this by moving your body back and forth over the bike, pushing on the bars when you are leaning over the stem, and pulling the bars when you are crouching back (bum over the rear hub and arms extended). After some practise, you'll be able to rock more and more. 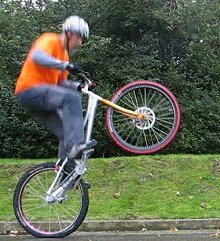 You should reach a point on the rear wheel where you will fall backwards instead of rocking again onto the front wheel. This is the point of balance where you should try to stay, by adjusting the position of your knees. Then the trick is to reach that point and try to bounce back instead of falling backwards. 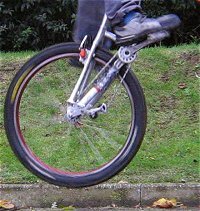 To do this, do not jump off the bike, but instead move up with an impulse and finish off by firming up your arms once you have reached the end of your extension. Initially, you'll be bouncing backwards, but that's a good start. Use your calfs to make all the adjustments and corrections in bouncing pressure and keep your ankles as lose a possible. 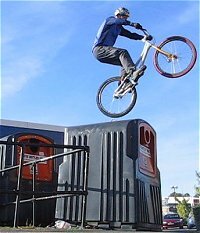 Move your body up and down, the bike follows on the way up as you grip the bars. On the way down, it is just more tyre compression for the next hop. Keep your brakes locked! Rocking back, move your hips back and bring the bike on its' rear wheel. Start a small extension on the bike, keeping the bars at the same position. This compresses the tyres.You end up a bit more in extension, standing on the pedals, with the bars and the bike in the same position as before. Your body is still moving up on its momentum. Firm up your arms so that your movement upwards naturally lifts the bike with you. At this stage, only your body has moved up.Now tuck your knees to let the tyre bounce the bike up. You've made your first hop! Just practise, practise, practise... and practise again... ;-) See this move in a video. Once you can bounce back a few hops, try to limit your momentum backwards by pulling less on the bars, and by staying in balance over the rear hub (instead of always leaning too much behind that axis). Also, one problem when you bounce back, is that your pedals won't stay level (because accidentally, the free-wheel ratchets up backwards, and also because when you rock from the horizontal to vertical position, your pedals follow the wheel-base alignement, and you won't be very comfortable). 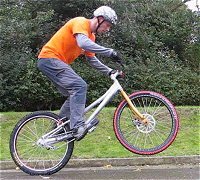 Re-adjust the pedals to a comfortable level-position, parallel to the ground, by quickly releasing the rear brake during a hop (re-adjust in mid-air). Lock the brakes again before the next hop. So now, you can bounce back, or nearly on the spot. For more movement control, try to tuck your knees in front of you instead of just under you, while extending your arms to bring the bike in front of you during each hop. Every hop will bring you one step forward. Flex your calfs and use them to control the bouncing effect, in compression and amplitude. This is key, as this is what will move your body up and down (not pulling on your arms). These hops allow you to control the rear tyre position with a lot of precision, and in a very soft way even if the ground is slippery or unreliable. Another way to move forward with each hop is to slightly kick in the driving pedal, towards the end of your upward impulse (releasing the brakes as you kick but locking them right after the kick). This will add a rolling effect to the bouncing, effectively moving forward or maybe just compensating for your backward momentum. But when the obstacle is slippery or very uneven, it is best to use the softer approach (because if you kick too hard, you risk to lose grip). On a grippy surface, each tiny kick will allow you to re-adjust your pedal position or move a small step forward, so you can really start to be precise with your hops. By adding some bar turn, shoulder twist and hip swing (in any combinations really), you'll be able to turn with each hop, while bouncing on the same spot. The more you kick while still on the ground, the more you will go forward, that leads you to the Pedal hop.